Fashionably fun and irresistibly fluffy, these girls in hats know just the thing to turn those kitty heads! Whats their fashion secret? 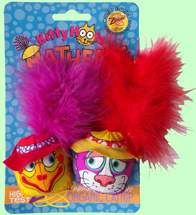 They’re packed with the world famous Zoom Around the Room High Test Organic Catnip plus their fantastically fluffy feathers will give your cat a whole new perspective on head wear! Approximately 9 cm in length.